A hallmark of modern American theater, and a major success on the Broadway stage, Lillian Hellman’s groundbreaking story of scandal and hysteria is timeless and hard-hitting drama at its finest! When a malicious student starts an unfounded rumor, an entire community is quickly engulfed in a devastating firestorm of misunderstanding, accusation, and hostility. 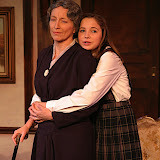 With crackling dialogue, and Hellman’s impeccable sense of timing and suspense, The Children’s Hour is a searing, riveting play that exposes the insidious power of lies, and their capacity to breed ignorance, intolerance, and fear. Don’t miss it!